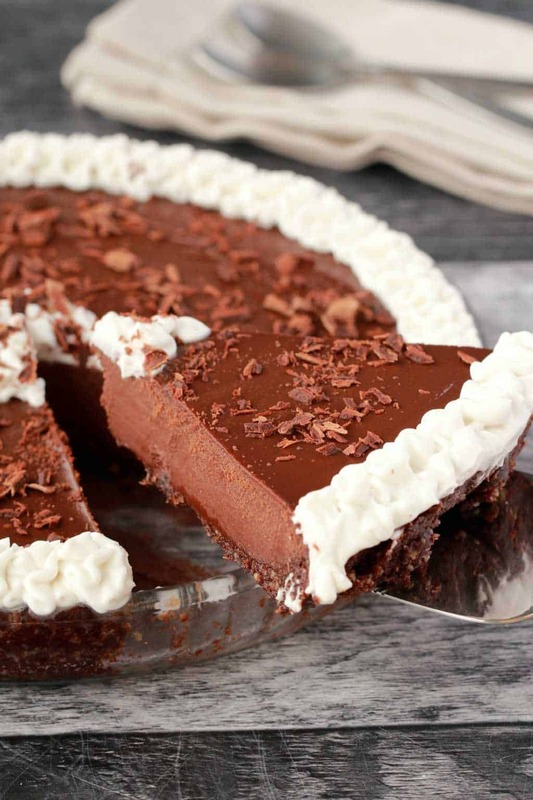 This vegan chocolate pie is pure decadent deliciousness! 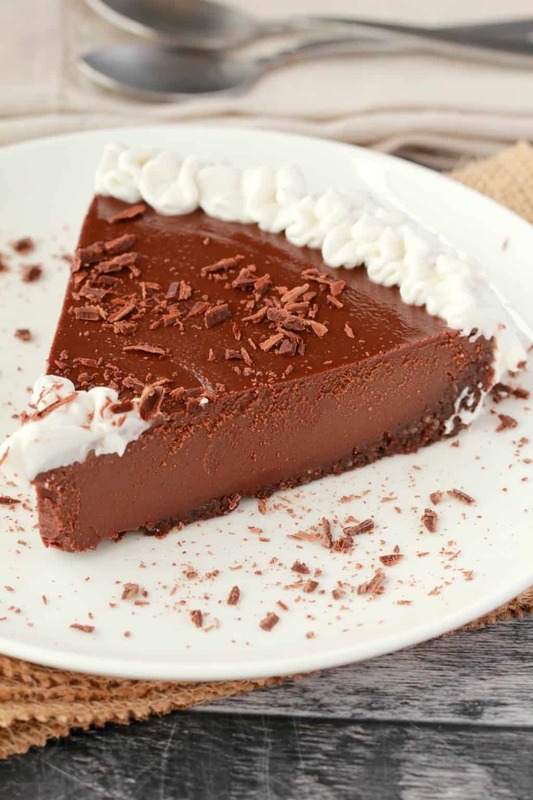 It is a rich, dark chocolate delight! And it’s super easy too! Lets do this! 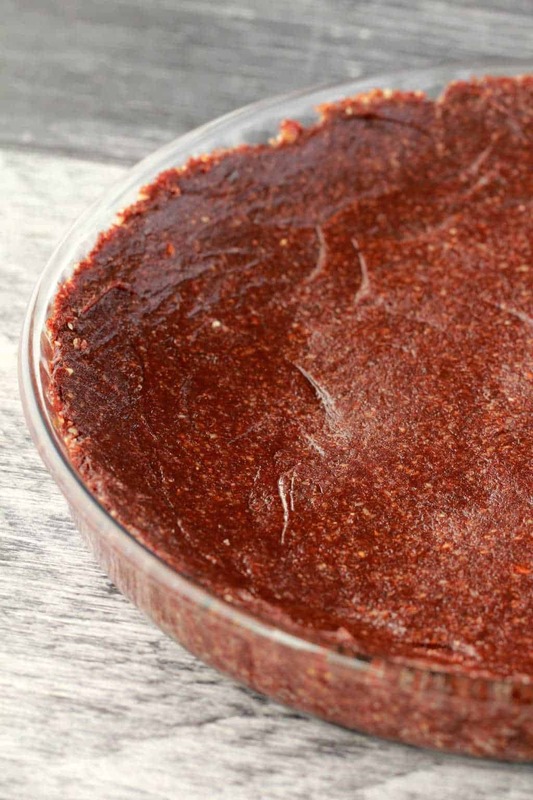 The crust is a made up of walnuts, dates and cocoa powder. The filling is a super rich almond butter and chocolate ganache! Vegan chocolate melted into coconut cream with almond butter! 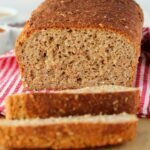 The almond butter gives it an extra richness and nutty flavor that matches perfectly with the date and nut crust. 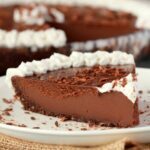 And then whipped coconut cream and chocolate shavings on top make this the vegan chocolate pie of your dreams! 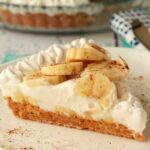 I recommend serving each slice with an extra dollop of whipped coconut cream on the plate, because the mildness of the cream cuts the richness of the pie just perfectly. This is a fridge tart and needs to be kept cold. 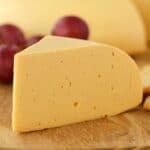 It starts to melt a little if it’s kept too long at room temperature, so fridge is best! 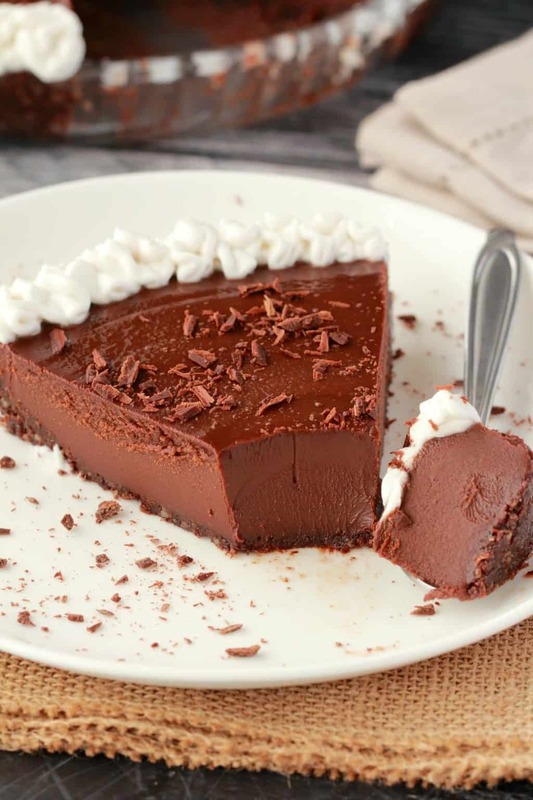 The texture is beautifully smooth and the taste is dark chocolate heaven! 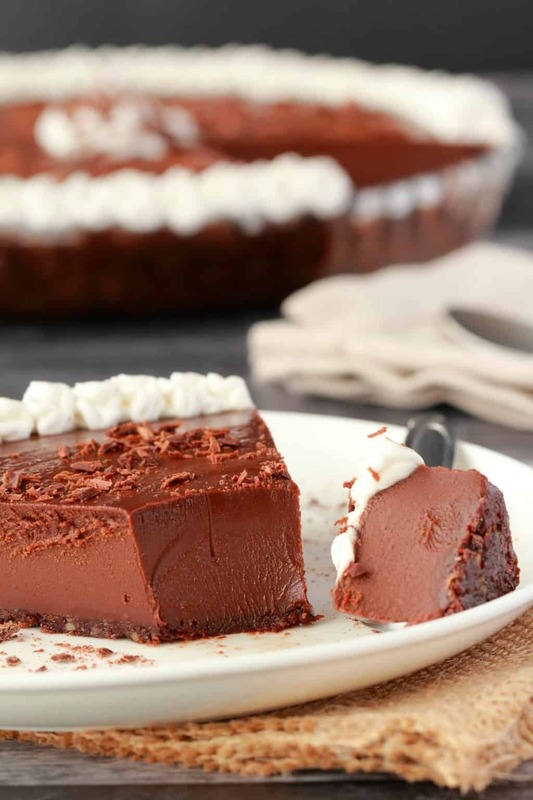 For people who don’t love the taste of coconut, you’ll be happy to know that the overriding taste here is rich chocolate, not coconut and you can always pair it with a whipped soy cream on top if you’re not a coconut fan. 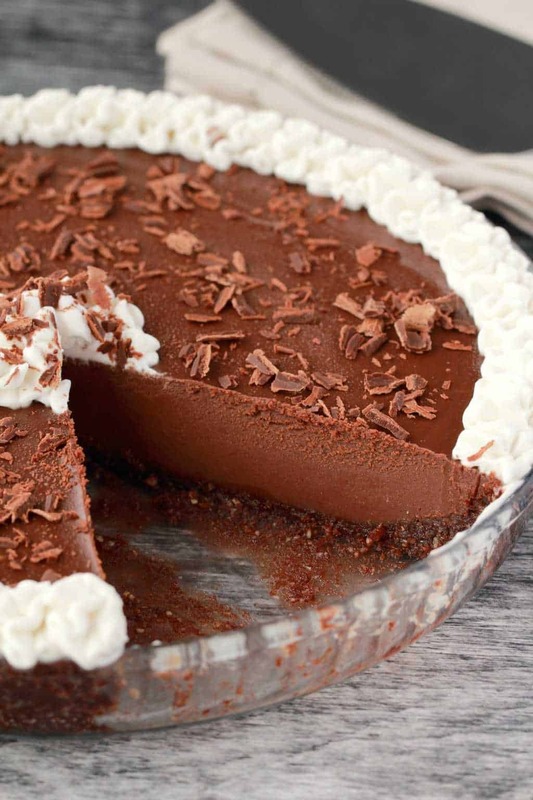 A crushed cookie crust would also work great for this, if you want some variation, or if that’s what you have on hand. I’m thinking a crushed oreo crust would be divine with this as well. 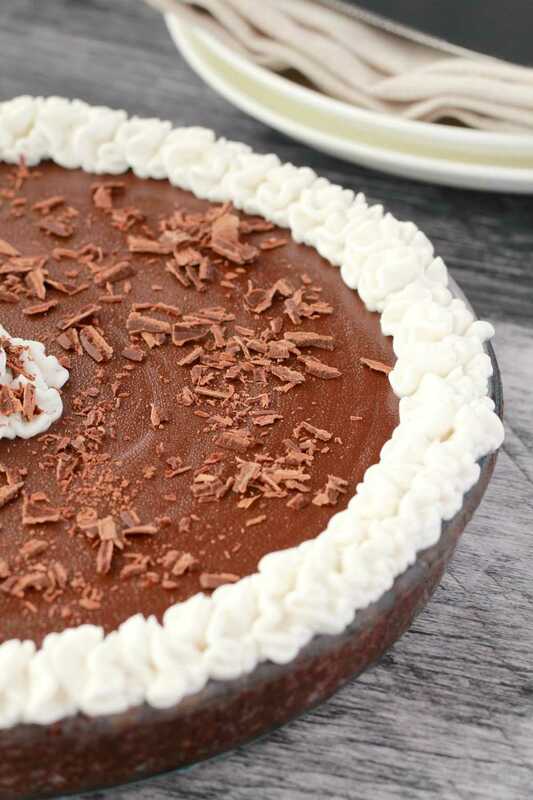 If you’re keen to try that, use the crust instructions from this vegan peanut butter pie. Keep it stored in the fridge and consume within 5-7 days. 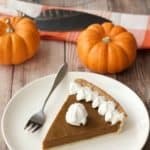 You can easily get 10 slices out of this pie, but it’s so rich, you might find yourself slicing it even thinner. 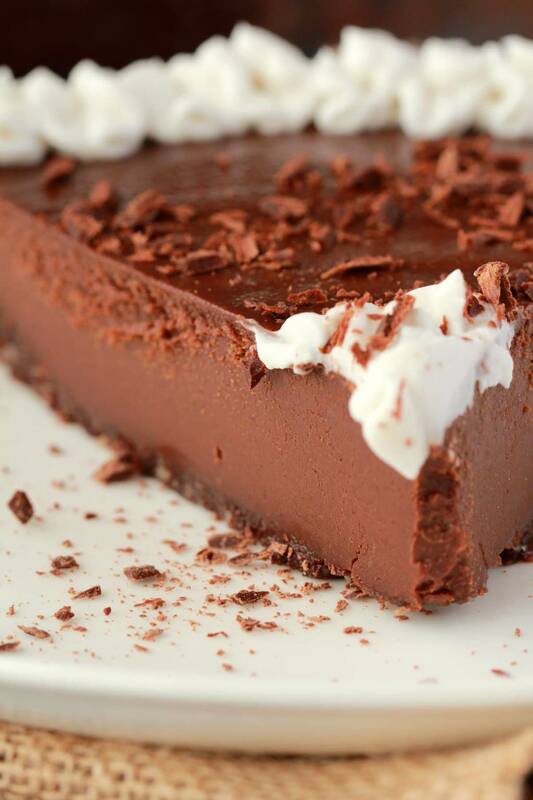 It’s the best thing for those chocolate cravings! 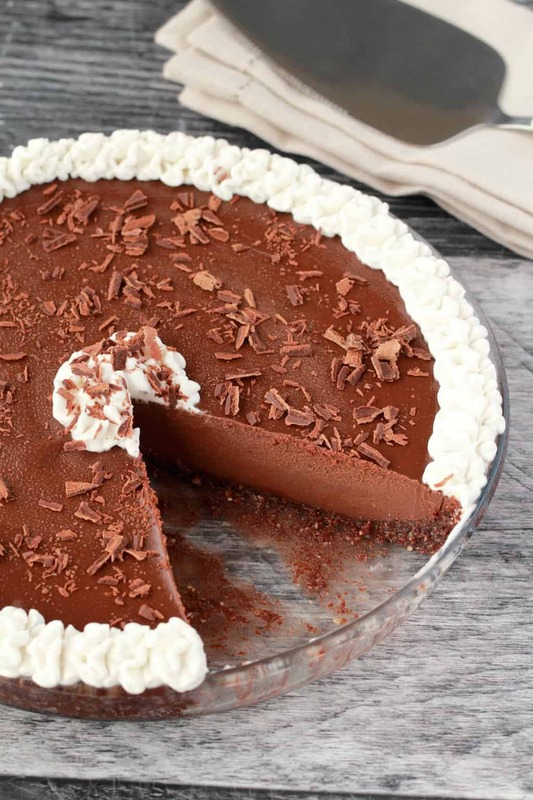 What do you think of this vegan chocolate pie? Tell us in the comments! And rate the recipe too please when you make it, it’s so helpful. Plus heaps more! 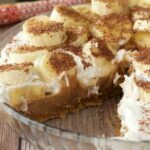 I’m a big fan of vegan pie! Sign up to our email list! 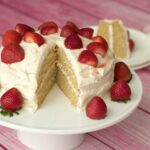 You’ll get an awesome free recipe book (10-great recipes!) and you’ll stay updated with all our latest recipes posted to the blog! 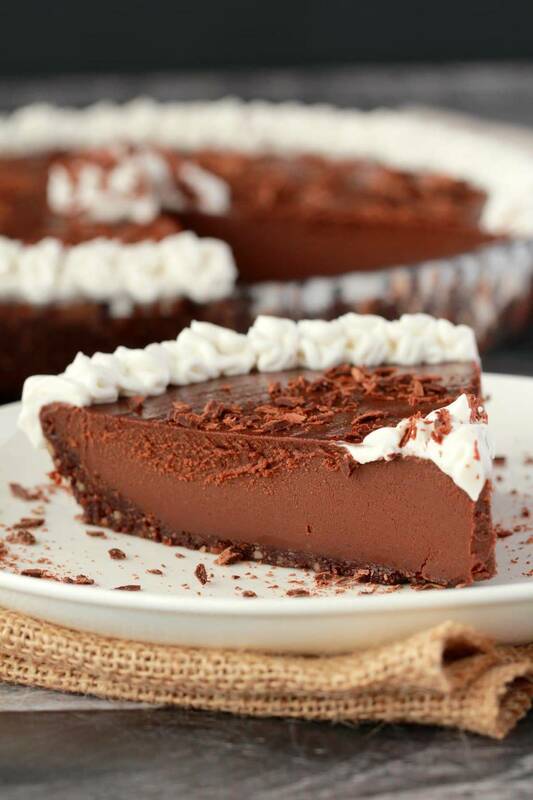 Ultra rich vegan chocolate pie. 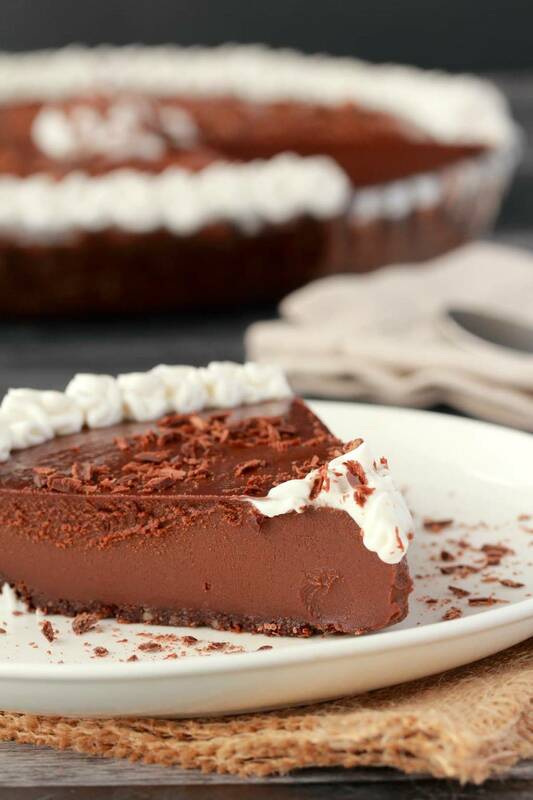 This easy 6-ingredient, mega-chocolatey, no-bake pie is silky smooth and velvety in texture and completely satisfies any and all chocolate cravings! Add the walnuts, dates and cocoa powder to the food processor and process until it starts to clump together and form a sticky dough. Place into the freezer to set while you work on the filling. 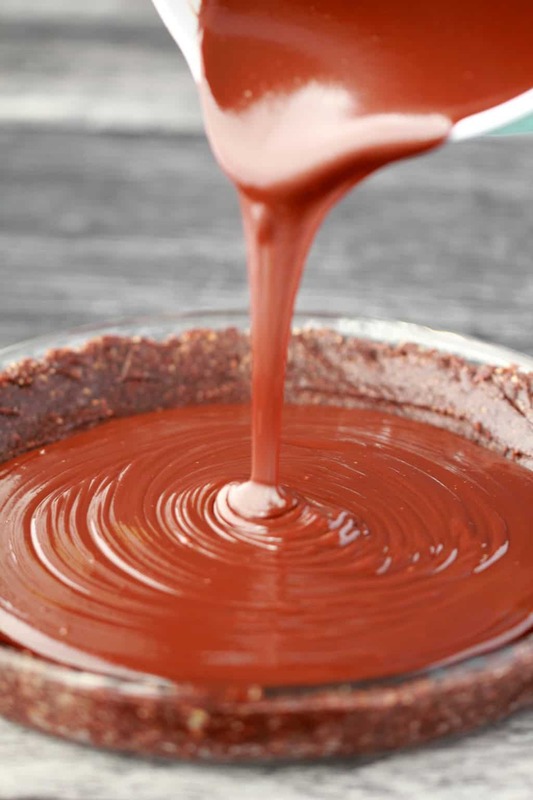 Break up the chocolate into pieces if using slabs and add to a mixing bowl. Place the almond butter on top of the chocolate pieces or chocolate chips. Set aside. Empty the can of coconut cream into a microwave safe dish OR into a saucepan. Heat to a simmer either on the stovetop or in the microwave. Pour the hot coconut cream over the chocolate pieces or chocolate chips and almond butter. 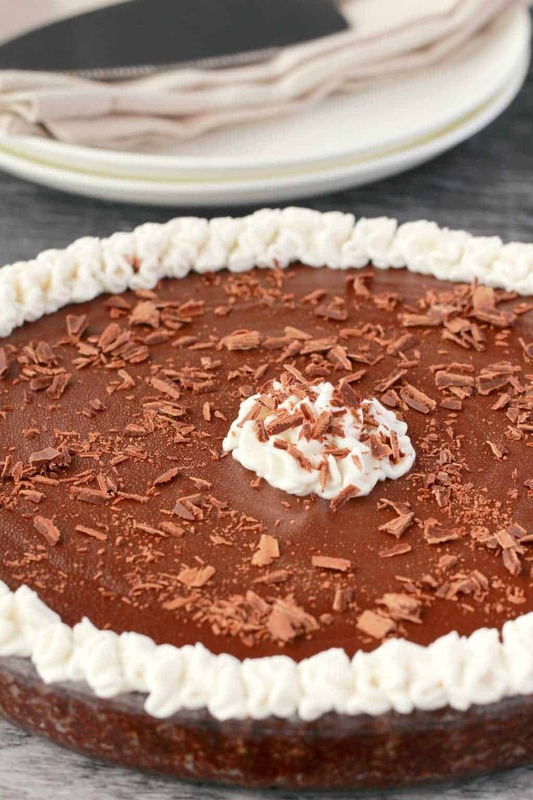 Make sure all the chocolate is covered with the hot coconut cream. Leave to sit for a minute. Whisk it with a hand whisk into a thick chocolate sauce. Pour this over the pie crust. Place into the fridge until completely set. 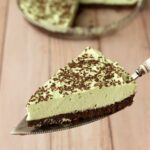 Serve with vegan whipped cream! *Nutritional information is for pie only without additional whipped cream. Previous Post: « Vegan Butternut Squash Soup – Roasted and Delicious! Well if vegans and gluten intolerant people can eat this, then who’s complaining – super decadent, rich and totally delicious! I made this for a ganache on vegan brownies so I didn’t have to miss out on dessert! SO GOOD!!! I wish that I’d made a pie because it’s so delicious. I was worried about it tasting like coconut but it really doesn’t. 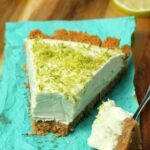 Could you make this with lighter coconut milk for a slightly lighter version? I love it but it’s soooo rich that I could only manage a few bites- I want to stuff my face! 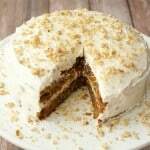 Could there be anything to substitute the coconut cream? Hi. I’ve just made this very yummy dessert as a thank you to my husband for taking such good care of me during a recent case of the flu😢 He has two great loves in this world; his family and chocolate. This recipe will certainly say THANK YOU! I did cut the chocolate by 1 cup as I also want to eat it. He said it was restaurant worthy and he’d pay at least 10 dollars per slice. Total success. Thank you for posting. Do you think I can replace the almond butter with a coconut based vegan margarine like nuttelex instead? Hoping to have this as my birthday cake in a couple days to share with my entirely vegan family! Who says Omnivores have more fun. 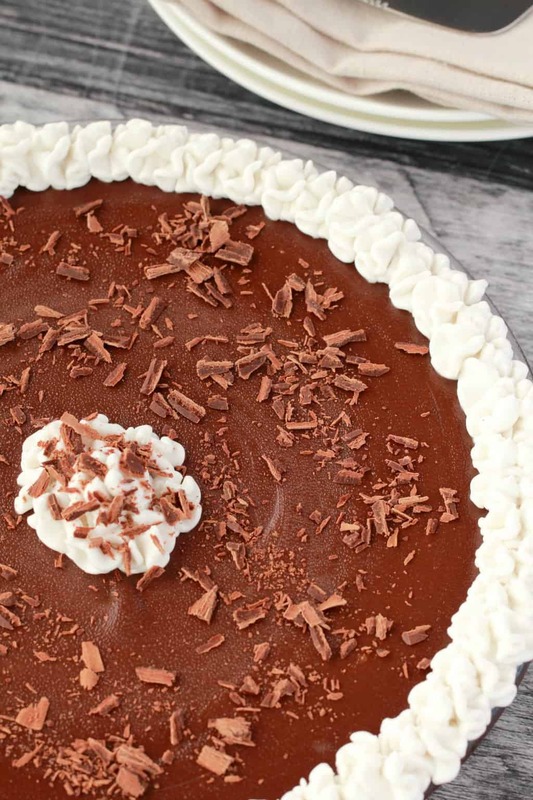 Do you think this would be equally delicious in a vegan pie crust shell instead of the date and chocolate one? Hi, how long does this pie take to set? It takes a few hours, probably around 4 hours.